This photo was taken during our trip to Boise, Idaho. 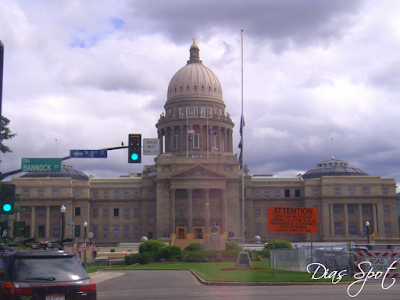 Boise City is Idaho's State Capitol. During our visit the Capitol was closed to the public for extensive renovations. Government offices have been temporarily moved to nearby state buildings. The main building was completed by 1913. It is the only state capitol to be heated by a geothermal well. The height of the capitol building is 208 feet (63 m) tall. There are underground tunnels beneath the capitol mall connecting the Capitol Building to the Supreme Court building and other government buildings. Used daily, these tunnels are accessible only to government employees and can be used as a bomb shelter to protect the Governor and other public servants. The Capitol Building has a special parking stall next to the main entrance stairway reserved for the governor's personal car. The governor's car uses the Idaho license plate number 1. The large bell directly in front of the Capitol Building is a scale replica of the Liberty Bell (uncracked). Pedestrians can ring the bell. The elevator on the east side of the rotunda could once be stopped between floors by forcing the doors open to view the walls of this elevator shaft that have been signed by hundreds of House and Senate pages, as well as elected representatives. The only meeting rooms in the building where the public is never welcome are the caucus chambers and the Senators' and Representatives' lounges. The state capitol was designed by Boise architects John E. Tourtellotte And Charles F. Hummel, partners who designed many church and educational buildings in Boise. The pillers in the main lobby area are not made of marble as many believe, they were created by artists in place behind sheets in secret as to not show the technique on how it was done to achieve the look of actual marble.